The art of interacting with people as deducted from a study of our beloved Prophet Muhammad’s (peace be upon him) life. – A product of more than twenty years of research. 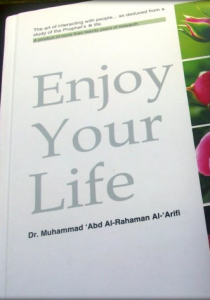 Enjoy Your Life by Sheikh Muhammad Al-Arifi is a book centered on developing and perfecting interpersonal skills based on Islamic Principles; whether that is with parents, children or students, friends, etc. This book is primarily based on the life of our beloved Prophet Muhammad (Peace be upon him). There are also numerous incidents from history and the author’s personal experiences. So, it’s not just a practical self-help book but it’s also a good lesson from history! Sheikh’s Arifi was inspired by Dale Carnegie’s book “How to Win Friends and Influence People”. He read this book when he was 17 and later realized that Carnegie himself did not benefit from his advice as he chose to end his own life. The Sheikh then began researching on the same subject from the life of Prophet Muhammad (pbuh) & Islamic History and compiled this book. The main theme of this book is – interacting with others in the best possible way. Furthermore, it is a practical guide to winning the hearts of those you know in order to benefit, correct and guide them. After reading this book I reckon the author achieved the goal he was trying to accomplish. I personally have changed due to the many advices contained in it Alhamdulilah; I also have shared what I learned with others (I kind of talk non-stop about it to friends sometimes!). Prophet (pbuh) showed the best of character, manners and communication skills with children, family, companions, women and even adversaries! There are many events narrated from the life of our beloved Prophet (pbuh) his companions & various icons from history. Reading this has increased my knowledge about their lives and character & my heart has developed even more love and respect for them. I would highly recommend this book! Whether you choose to read each chapter of this book in order or you are amongst those who like to skip around, you will still find this book to be very beneficial Insha’Allah. Although I hope every Muslim purchases this book, I would suggest Enjoy Your Life especially for Imams, teachers and parents. And remember, if they benefit from the advice and act upon it, you earn reward insha’Allah! Brothers and Sisters, you should really add this book to your library. It’s a must-have, can’t-do-without. It will benefit you for many years to come, Insha’Allah. I wish there was an Enjoy Your Life – Part 2! Till then I will continue to re-read the chapters and implement them insha’Allah.